Porcelain – a ceramic, which does not lose its beauty over time. With careful handling can serve to delight the eyes forever. There are different types of porcelain, characterized by its composition and method of manufacture. The word "porcelain" as a term includes all pottery, both white and translucent. With crockery, the world was introduced to the Chinese. By the way, from porcelain they did not only dishes, but also benches, gazebos, musical instruments etc. 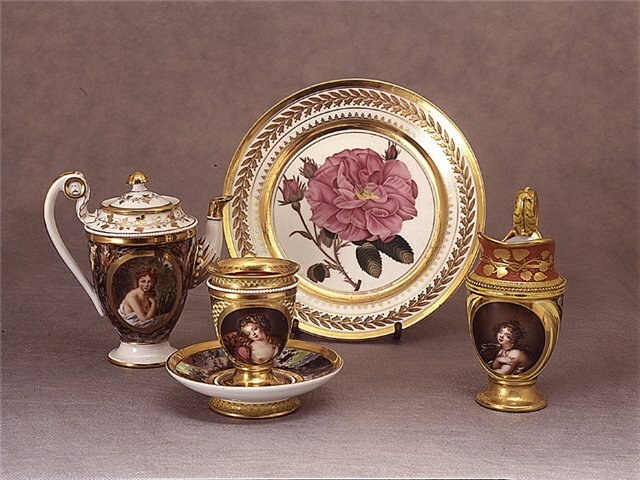 All existing to date, the porcelain can be divided into three groups: European hard porcelain, soft porcelain, or profafor, and Oriental porcelain. Oriental and European ceramics made from kaolin, which includes clay and feldspar. For the production of porcelain requires more kaolin than for the production of the Eastern, and the procedure of firing it is at a higher temperature. This makes the final product more transparency, but there is a disadvantage – the absence of all colors except blue. That is why the European porcelain paint over the glaze, and the Eastern provides underglaze painting. The structure of the porcelain can be hard or soft. Solid more than half consists of kaolin and a quarter of quartz. The remaining part is occupied by feldspar. Bone China is a type of hard-paste porcelain and 50% of bone ash. It features a special white, concoctent and translucence. Soft porcelain is more diverse in chemical composition and require a more gentle heat treatment. Fusible glaze, making it similar to Chinese porcelain, allows for a more dense writing and a much more gentle tone. The prepared mixture consisting of clay, quartz, kaolin and other materials poured into special plaster molds, hollow inside. As the accumulation of gypsum in the water contained in the solution, the outer layer of the workpiece hardens. The more it costs, the greater the wall thickness gets. Unnecessary the solution is decanted, and the workpiece is prepared for painting or for further firing polished, clean burrs, etc. Complicated things collected from several parts. If paint is applied on the raw porcelain is covered with transparent glaze and put them in kiln at a temperature of 1350°C, this method of painting is called underglaze. When firing the paint is fused into the glaze and allows you to get an excellent product with improved properties, as well as strength and resistance to mechanical and chemical damage. Overglaze painting has a more rich palette of colors. For roasting such products enough temperature 780-850°C. Bone China is fired at lower temperatures than solid. For overglaze painting used formulations based on gum turpentine and turpentine oil. Underglaze paint diluted water and sugar with the addition of a small amount of glycerin.